Playing your saxophone in tune with others in your band requires much more than simply playing a reference note into a tuner and adjusting the mouthpiece on the instrument. In order to really understand the tuning process and how best to tune your saxophone, it helps to know the physics behind the sound that you produce while playing. When we are talking about physics and the saxophone we are dealing in the realm of invisible vibrations called sound waves. To better understand these sound waves it helps to think about a guitar string. When you pluck a note on a guitar the string vibrates at a specific rate or "frequency." The length of this string dictates what frequency the string will vibrate at. By moving your finger up and down the fretboard you can change the pitch to any of a dozen or so pitches. Now think about a fretless guitar. Instead of a dozen pitches, you could potentially have hundreds of pitches, each very slightly different than the other. 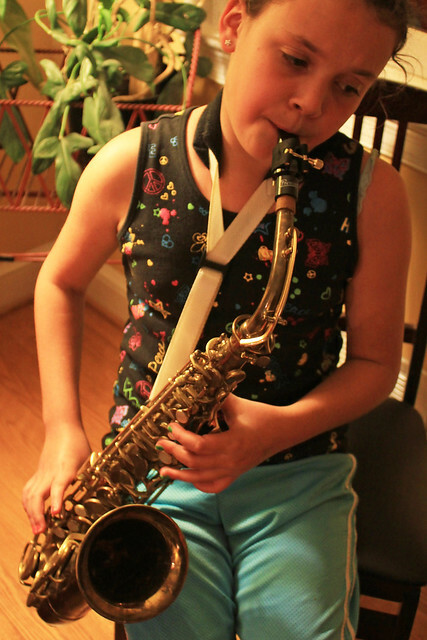 Saxophones behave in this same way but use a vibrating column of air instead of a vibrating string. When you add or subtract fingers on the saxophone you are changing the overall length of the tube, creating shorter or longer sound waves in the process. Many things can affect this resultant wave. A key that is not adjusted properly can partially close over an open hole causing all notes above that key to be slightly flat. Likewise, a key that is left open when it should be closed can make other notes out of tune or at the very least sound less focused. Two saxophones that are not perfectly tuned to each other will always vibrate at different frequencies even when playing the same note. When two sound waves of the exact same frequency are played together they reinforce each other creating a stronger, more pleasing overall sound. When two pitches are slightly out of tune they occasionally collide with each other causing a disturbance in the combined waveform. This phenomenon creates audible "beats" or bumps in what the listener hears. Each bump in the combined sound is literally the two sound waves slamming into each other. It is often easier to understand this process by seeing it visually. Take a look at the examples shown at http://library.thinkquest.org/19537/Physics.html. As a saxophone player, it should be your goal to learn how to play your instrument in perfect tune. Unfortunately, this requires more than simply tuning your concert A or B-flat. Now that you know a little about the physics of sound, however, you can begin to understand the inherent pitch problems of your saxophone and relate this to your overall performance and study routine.